Around Maidstone on Electric Bikes... in the Rain! It should perhaps have been expected. As the rain fell and we cowered, shivering and wet to the bone, in the corner of the cafeteria at Headcorn Aerodrome, the Great British summer had once again become the victim of thick, dark rain clouds that showed no sign of dissipating. The sweltering heat two-days previous seemed incongruous by nature, and another washout was on the cards. Yet, despite the downpours, the spirit refused to be dampened, and the journey to the aerodrome was just one leg of a fun-filled adventure. After all, who can resist the allure of cycling full speed through the biggest of big puddles? The plan had been simple: new members of the Visit Maidstone team would join existing staff on an outing exploring a host of lesser-known delights of the borough. What’s more, each stop-off point could be easily accessed on a gentle cycling expedition. Best of all, for those less enamoured by pedalling their way around the region, the journey would be on electric bikes, meaning there was no need to expend any energy whatsoever. Perfect! And then there was the weather. It’s not uncommon to poke fun at the inclement tendencies of the summer months in the UK, but the ferocity of the rainfall on this August day was simply remarkable. At the beginning of the day, the executive decision was made to leave the bikes behind and wait for a break in the rain before taking to the saddle. But our time in the rain would come. First, though, we’d journey by car to the first venue on our tour – the Hush Heath Winery. Arriving at Hush Heath just before 11am, we were welcomed warmly and given the chance to find out more about the process behind the wine production. As we toured behind the scenes, it was fascinating to discover some of the most cutting-edge machinery available in the wine industry. We were shown the pressing mechanism – which, to some disappointment, doesn’t involve the staff’s feet trampling grapes, but rather a slowly inflating balloon-type thing (technical term forgotten I’m afraid) that crushes the fruit – as well as learning more about the fermentation process. In addition, we also saw the bottling and labelling of the winery’s acclaimed Balfour 1503, a process which is remarkable in speed and efficiency. 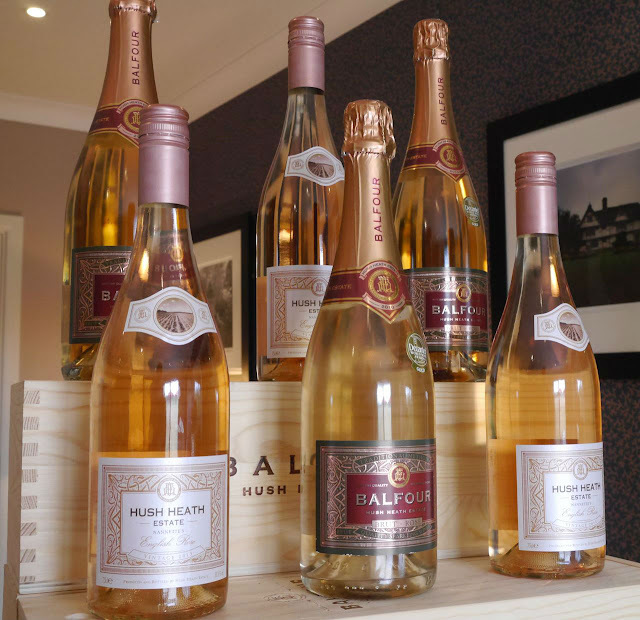 With over 100,000 bottles of wine produced each year, and a host of varieties and ciders available, the Hush Heath Winery has developed a reputation for being one of the most acclaimed vineyards in the region, even working with leading cruise lines in the supply of fine wine. As such, it didn’t take much convincing to sample some of the options available… or part with some money to purchase ‘souvenirs’. From the winery, we took advantage of a brief respite in the rain and made our way across Staplehurst to the Iden Croft Herb Garden. Set within a 15th-century walled garden, the herb garden was distinctive in aroma, with the fragrant herbs that thrive in the area the perfect complement to the sense of serenity that was abundant. Had the weather been kinder, it would’ve been the ideal setting in which to unwind with a picnic or grab a cup of coffee from the tea room on site. There were even two lots of swing ball set up in one of the gardens, and I defy anyone to resist a game of swing ball! 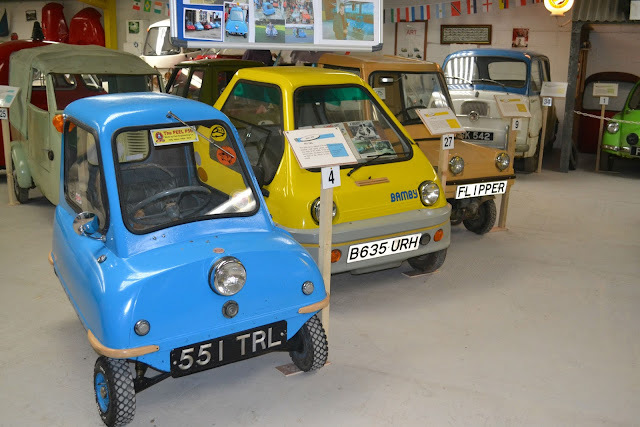 A short drive took us next to the Hammond Collection of Micro Cars. 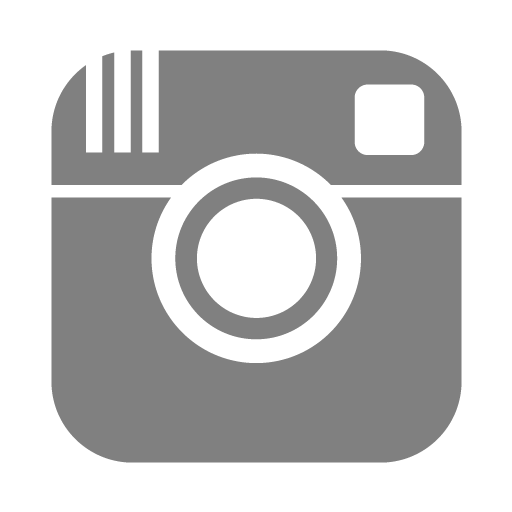 The term ‘hidden gem’ is often bandied around to try and draw visitors to an attraction that is anything but. When it comes to the Hammond Collection of Micro Cars, however, there is no finer, nor more accurate, description. Entering the workshop, a number of restoration projects are underway, and the presence of the classic Sinclair C5 is of particular interest. Pop your head around the corner and into the main collection, meanwhile, and the explosion of colour, quirkiness, diversity, and fun is simply overwhelming. Some 45 vehicles of all shapes and sizes are packed into the collection, and the team running the museum offer compelling stories behind each model in the room. When it comes to a hidden gem, this truly deserves such an auspicious title. Of course, it didn’t take long for the dark clouds to reappear, so we headed onwards to our next stop, the Weald of Kent Golf Course and Hotel. Having recently undergone development work with the addition of some modern and contemporary hotel rooms, the Weald of Kent is far more than a humble golf course. Catering to weddings, corporate events, and diners, this is the epitome of a modern venue. There’s even been a new gym constructed, complete with the very latest in exercise equipment (and one rather embarrassed gym member that was somewhat surprised when we all entered the room covered in raincoats and soggy shoes!). All that time in the gym (well, three minutes looking around) had built up an appetite, so we were grateful that the Weald of Kent was able to accommodate us for lunch. The varied lunch menu was impressive and affordable, so there was plenty of choice. A word of warning to any potential diners, however: when the waitress says the Chip ‘N’ Dip comes with a lot of chips, she means a LOT. It was like a pyramid forged from a million-and-one potatoes… but in a good way. Lunch devoured, we decided it was time to brave the elements and give the electric bikes a go. After a quick demonstration, a test run in the car park, and the inevitable resumption of the rain, it was time to go. And go we did. As the rain continued, so did the two-wheel adventure. Starting at just £30 to hire, it’s not surprising that electric bike hire is proving such a hit, with stag parties and hen dos, birthdays and foreign visitors all taking advantage of this fun means of exploration. We continued on our journey towards Headcorn Aerodrome, ever-hopeful that the rain may stop and we could enjoy witnessing some skydiving or other aviation displays. It was with a slight sense of disappointment, therefore, that no such activity would – or could – occur during our visit. Due to the exceptionally bad conditions, any displays or events at Headcorn Aerodrome were put on hold. That said, there was still plenty to keep us occupied. With the Aero Legends now based on site, we had the chance to meet with one of the pilots that takes people up to the skies in vintage aircraft. He told us how bookings for Spitfire flights were sold out for over 12 months, with enthusiasts prepared to pay thousands to enjoy a once-in-a-lifetime flight above such recognisable landmarks as Leeds Castle. Though we tried to engineer a free (or hugely discounted) trial run in the Spitfire, we were unsuccessful, but will definitely be heading down to the airfield to enjoy the flypasts over the months to come. Time was quickly running out for our tour of the region, so it was time to get back in the saddle and brave the conditions once more. A glance to the heavens showed no sign of sun, so we battled through the rain en route to our last port of call – Biddenden Vineyards. A welcome cup of coffee to warm the soul was gratefully received, and another sample of the wines and ciders enabled us to end the day how it had started. Sodden and soaked to the core, we couldn’t help but feel somewhat guilty for dripping rainwater throughout the Biddenden Vineyard shop, so we quickly made our retreat and headed for home. Back on the road, there was still time to enjoy breezing through the puddles on the road – and narrowly avoid being drowned as passing vans splashed alongside us – and the smiles returned to our faces. And then, before we knew it, we were back at the Bloomsbury Retreat, dropping off the bikes and heading for our cars. Though a nice, hot shower has seldom been more welcome, the fun had throughout the day was undoubtedly accentuated by the challenge of the rain. Regardless of conditions, there is so much to discover for all ages. So, whether it’s wine tasting or aviation, golf or fine dining, Maidstone borough offers a host of activities to experience, and the means to discover them like no other.